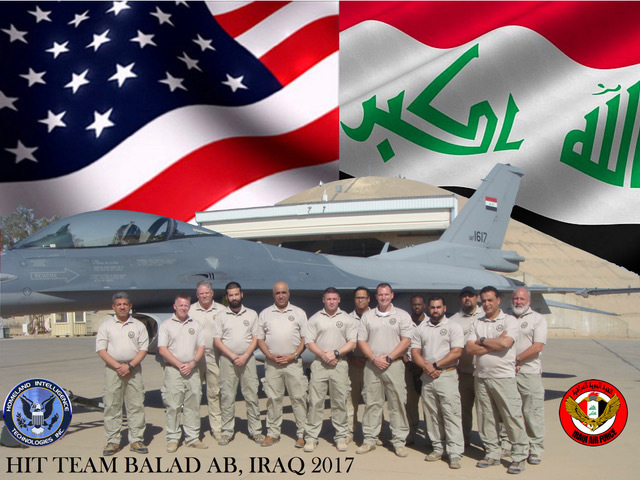 Iraq - Homeland Intelligence Technologies, Inc.
HITI has provided the Iraqi Air Force at Balad Air Base, Iraq, with security services. These services include security observations, assessments, and reports on base-wide security activities and concerns as it relates to security note compliance to the Contractor Security Director to ensure base security efforts remain up-to-date with the regions' changing security threats and to maintain security and operational proficiency. HITI maintained security proficiency in mentoring and operations in accordance with approved training, the Base Defense Plan, Performance Work Statement, and the Letter of Acceptance. HITI has also collaborated with the Government of Iraq and the USG on the F-16 beddown program at Balad Air Base, Iraq, to ensure successful delivery of F-16 aircraft. The encompasses the development of a comprehensive inspection checklist, identifying critical evaluations and standards enforcement sectors for base expansion, collaborating with the Iraqi Air Force on the development of the Base Defense Plan to outline day-to-day operations and standards set forth by the USG, and developing of real world Diversion Plans. HITI has conducted yearly Risk Assessments to identify any vulnerabilities or discrepancies to Balad Air Base physical security and operational efficiency. HITI has also conducted Quality Assurance and Quality Control in order to review the security postures and Tactics/Techniques/Procedures of various Balad Air Base security functions. This includes conducting a minimum of two security reviews yearly, ensuring security personnel remain up-to-date with the region's changing security threat and conditions, and maintaining a database for security assessments and observations conducted on Balad Air Base.